Discover Trade so you can build a Market and bargain with other Captains for the Resources and Sketches you want. Requires no Sketches. 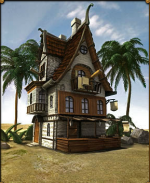 Research time: 14 s.
Discovering Mathematics lets you build the House o'Navigation. 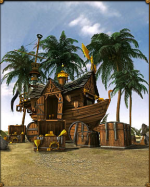 Each time you upgrade this building you will increase the carrying capacity of your trading Galleons. 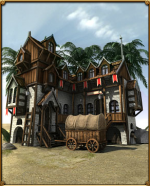 Research time: 29 m. 23 s.
Discovering Smuggling lets you build the Merchants' Guild in your Pirate Haven. Upgrading this building speeds them safely on their way! 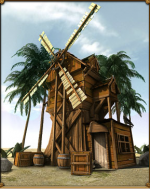 Discovering Banking will let you build a Windmill to speed up Rum production. Research time: 3 h. 55 m. 17 s.
If you discover Manufacturing you can build a Sawmill. 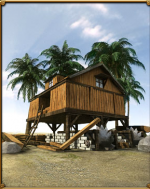 Building a Sawmill boosts your Lumber production. +5% faster with each upgrade. 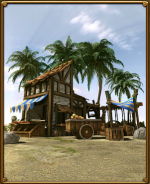 Discovering Mercantilism allows you to build the Goldsmith shop. It boosts the rate at which you accumulate Gold by 5% with each level upgrade. This page was last modified on 7 August 2014, at 20:19. This page has been accessed 18,295 times.